02 - About Fenway | Fenway Health: Health Care Is A Right, Not A Privilege. 02 – About Fenway | Fenway Health: Health Care Is A Right, Not A Privilege. 02 – About Fenway – Fenway Health: Health Care Is A Right, Not A Privilege. In its early days, Fenway was a drop-in clinic providing free blood pressure checks and STD screenings. Over the years, Fenway obtained permanent space and incorporated as a freestanding health center with a staff of one volunteer doctor, one nurse and one intake worker. 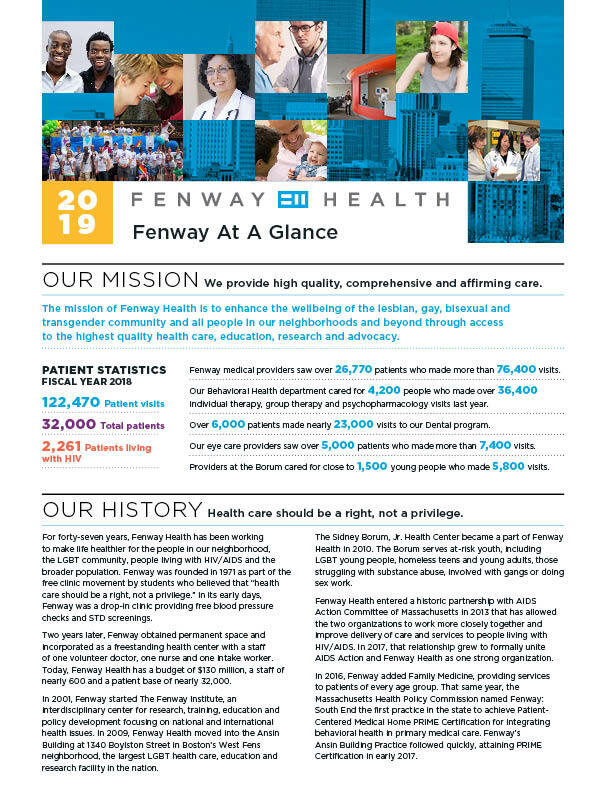 Today, Fenway Health has a budget of more than $90 million, a staff of 500 and a patient population of more than 28,000. In 2013, the AIDS Action Committee of Massachusetts also became a part of Fenway Health. AIDS Action serves people living with HIV/AIDS and populations at risk of infection, and leads the state’s Getting To Zero Coalition, which seeks to reduce the number of HIV infections to zero. It also operates a needle exchange that serves as an entry point to healthcare services for active substance users.